This species is accepted, and its native range is Sri Lanka, Nepal to S. China and Indo-China. Herbs, clumping, small to medium sized, somewhat robust, to 1m, evergreen. Stems erect, hypogeal, basally much branched. 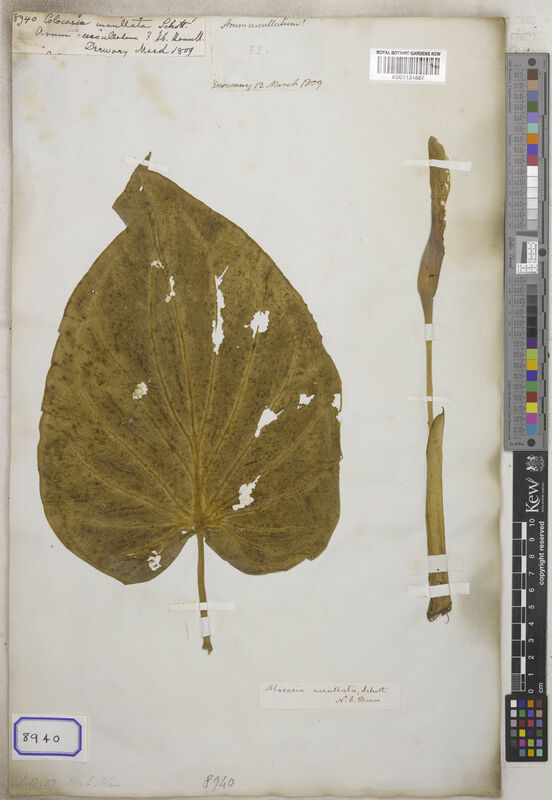 Leaves many together; petiole weakly D-shaped in cross section, 25–30(–80)cm, sheath reaching to ca. 1/2 way, margins membranous; leaf blade broadly ovate-cordate, 10–40 × 7–28cm, base shallowly cordate, apex acute; primary veins 4 on each side, radiating from petiole, arching, interprimary veins not forming a collective vein. Inflorescences rarely produced, usually solitary, sometimes paired, among leaf bases, subtended by membranous cataphylls; peduncle 20–30cm. 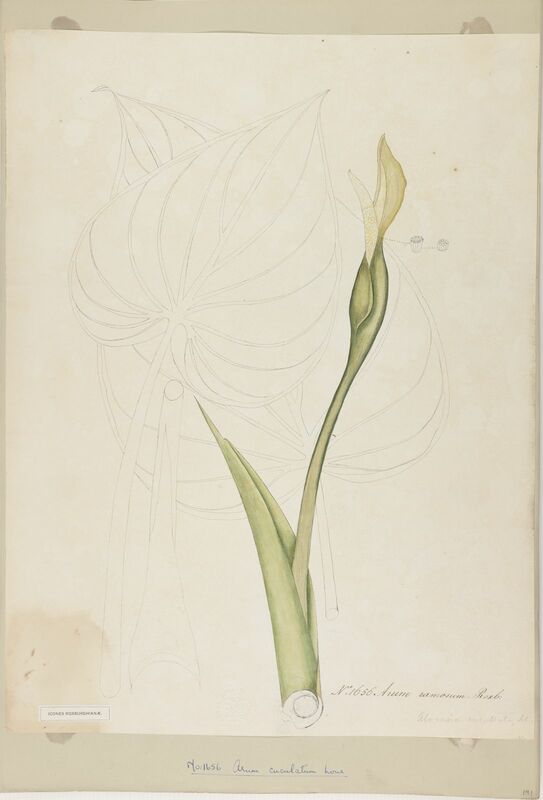 Spathe green, 9–15cm; proximal spathe 4–8 × ca. 2.5cm; limb narrowly cymbiform, 5–10 × 3–5cm. 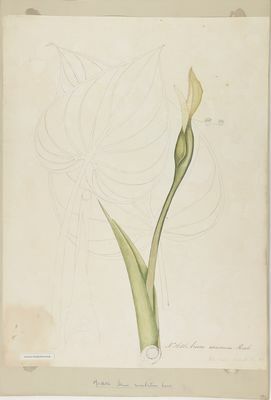 Spadix 8–14cm; female zone cylindric, 1.5–2.5cm × ca. 7mm; sterile zone 2–3cm × ca. 3mm; male zone yellow, ca. 3.4cm × 8mm; appendix yellowish, narrowly conic, ca. 3.5cm × 5mm. Fruit rarely produced, a subglobose berry, 6–8mm in diam., ripening red. Watersides, by fields, ?wild or cultivated. Cook Is., Costa Rica, Honduras, Japan, Nansei-shoto, Ogasawara-shoto, Windward Is.